The seed for this post was originally a discussion on the architecture of Henry Klumb* sponsored by the Preservation Committee of Puerto Rico’s Architects and Landscape Architects Association (CAAPPR) and docomomo_puerto rico (the local chapter of the International Organization for the Documentation and Conservation of Modern Movement) that I proudly presided at the time. As expected, I have slightly edited the text. On March 29 (2015) opened the exhibition Latin America in Construction: Architecture (from) 1955 (to) 1980 at the Museum of Modern Art in New York. It celebrated the 60th anniversary of the exhibition that MoMA organized in 1955 about Latin American architecture built by 1945. At that time, the architectural production of a decade was presented and in representation of modern architecture in Puerto Rico, two works were exhibited: the Caribe Hilton Hotel by Toro y Ferrer Arquitectos and the Sanctuary of San Martín de Porres by Henry Klumb. In the assembly of a large-scale exhibition like this one, omissions are understandable, especially since including a whole sampling of works and figures from multiple countries is most certainly not an easy task. The problem — or rather what bothers me to this day — which is what somehow happened with the works chosen to represent Puerto Rican modern architecture 60 years ago — is that MoMA seems to perpetuate the promotion of IMAGES before IDEAS. In the 1955 exhibition, its curator, Henry Russell Hitchcock, chose to describe the Sanctuary of San Martín de Porres — when comparing it to the ecclesiastical work of Oscar Niemeyer — as lacking dramatic spatial effects, just for the simple fact that its scale is not as monumental as the work of the Brazilian architect. Referring to the diagonally arranged piers employed by Klumb at San Martín as light deflectors — dazzled perhaps by the fact that the chapel is open to natural ventilation — Hitchcock wasted the opportunity to recognize the spatial idea behind the structural elements. With the piers, as designed and built, Klumb recognized the religious commitment of the Order of Preachers, also known as the Dominican Order, to amplify and promote the spread of the gospel. If the first Dominican churches in the New World resorted to monumentality to carry over the word of God, at San Martín, Klumb used the angled walls dramatize the diffusion of the Dominican ecclesiastical message. More importantly, it surprises that despite the fact that the 2015 exhibition had the support of the Architecture and Construction Archive of the School of Architecture of the University of Puerto Rico (AACUPR in Spanish), curators wasted the opportunity to include a more representative work. Henry Klumb’s Dominican Friars Convent built in 1958 in Bayamón, Puerto Rico, would have proved a better example. A work in which the late architect, 10 years after having conceived San Martín de Porres, had enough time to rethink and mature the spatial ideas and architectural details he would rehearse in Cataño. The following analytical drawings further illustrate the point. Abstract axonometric animation on the evolution of the spatial ideas at play at the Sanctuary to San Martín de Porres the Dominican Convent. The photographs and sketches above illustrate how the diagonally arranged piers provide a dual spatial experience. On both buildings, while attending mass (looking at the altar) the angled piers become a solid plane that frames our attention towards the liturgical event. In contrast, looking away from the altar the piers become a transparent plane that allows the interior space to extend beyond its built boundaries. In contrast to the tight suburban lot where Klumb had to erect the sanctuary, the site at the convent was larger. Therefore, the spatial quality achieved at San Martín, aided by the hanging plants and low concrete walls, was further expanded at the Dominican residence, not only at the church space, but throughout the complex. At the time of the lecture on this subject (in 2015) many of those present at the event did not know the Dominican Seminary. And that should have made us think, that while we recognized the omissions of the exhibition of the Museum of Modern Art, we also needed to reconsider ours locally. MoMA’s omissions are justified because any exhibition constitutes an act of summarizing. And anyone that summarizes, at the same time undoes and, as result, remakes history. * Henry Klumb, was a German architect born in 1905. He emigrated in 1927 to the United States to become an apprentice at Frank Lloyd Wright’s Taliesin North in Wisconsin. After five years, he left Taliesin and worked briefly with Louis I. Kahn and Louis Metzinger, forming the Cooperative Planners firm in Philadelphia during the period of the Great Depression. In 1944 he was invited by Rexford Tugwell (Governor of Puerto Rico at the time) to work as design consultant at the Public Works Design Committee. A few years later, he established the Office of Henry Klumb in San Juan from where he designed all types of private and public projects all over the Island. *** Despite the myopia with which MoMA decided to carry out the exhibition, Dr. Enrique Vivoni (former director and founder of the Architecture and Construction Archive of the School of Architecture at University of Puerto Rico; entity that preserves the historical documents of myriad architectural firms of the Island) clarified in the commented bibliography section that he was asked to produce for the exhibition catalog, the existence of an analytical/critical tradition of architecture in Puerto Rico. Designed by Steven Holl, the Chapel of Saint Ignatius was conceived as “…seven bottles of light in a stone box…” in reference to San Ignacio de Loyola’s vision of a spiritual life comprised of darkness and light, which he referred as consolations and desolations. The chapel was built in 1997 and it is located in the campus of Seattle University in First Hill, Downtown Seattle. The main structure of the chapel was erected in twelve hours due to the use of tilt-up concrete walls. Such method of tilt-up construction is traditionally used where the repetition and mass production of panels guarantee speed, therefore cost-effectiveness. In contrast, every panel used at the chapel is unique. Each pre-cast concrete wall (“stone box”) has a distinct profile designed to interlock in order to form slits that let in natural light. In addition, the walls provide distinctive profiles from where a lightweight construction roof curves and contorts to form skylights (“bottles of light“) that allow in additional natural light. The light entering through the slits and skylights is filtrated by a mix of colored, translucent and transparent glass and it does not enter directly into the space. Curving walls serve as baffles where light bounce off. Each baffle has a complementary color to the color of the glass. The reflected light gets redirected towards the walls in a subtle — yet intense — way. All interior walls have been finished with a textured plaster and what seems at first as an odd design decision, once bathed in light, becomes clear to the keen observer. The sketches below record my first two visits to the chapel. It was raining during my first visit so I could not experience the incidence of natural light entering through the skylights. On the second visit, however, the experience was completely different. When the reflected colored natural light structs the rugged texture of the interior plaster, it creates an optical illusion. Father Gerald T. Cobb S.J. refers to the light that enters the chapel as “…light that acts like liquid, an aqueous medium spilling across interior surfaces.” In truth, it is a difficult effect to describe but the chapel interiors bathed in light give a sense as if inhabiting a watercolor. Entrance & Procession; view from the Narthex towards the Baptistry. 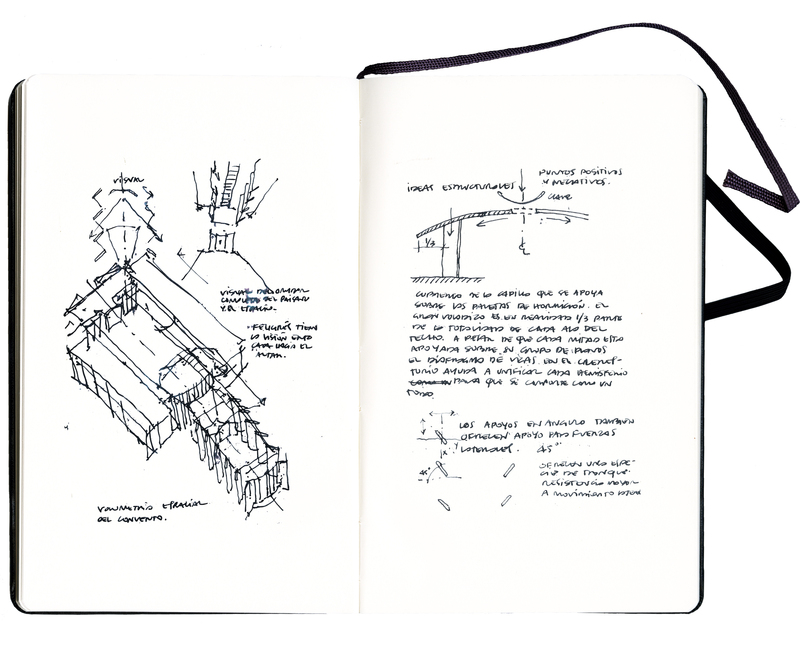 Holl assures us that “architecture holds the power to inspire and transform our day-to-day existence.” And while I do not claim that my sketches illustrate the phenomenon I experienced, they certainly give a sense of the spatial quality of the chapel. In fact, in my opinion, having examined Holl’s own watercolors for Saint Ignatius, they also fall short at representing the effect. However, whether intentional or not, the experience is there. Well done Holl. Estos son algunos bocetos que realicé el pasado sábado mientras acompañaba a Jorge Rigau y su curso de Historia del Caribe. 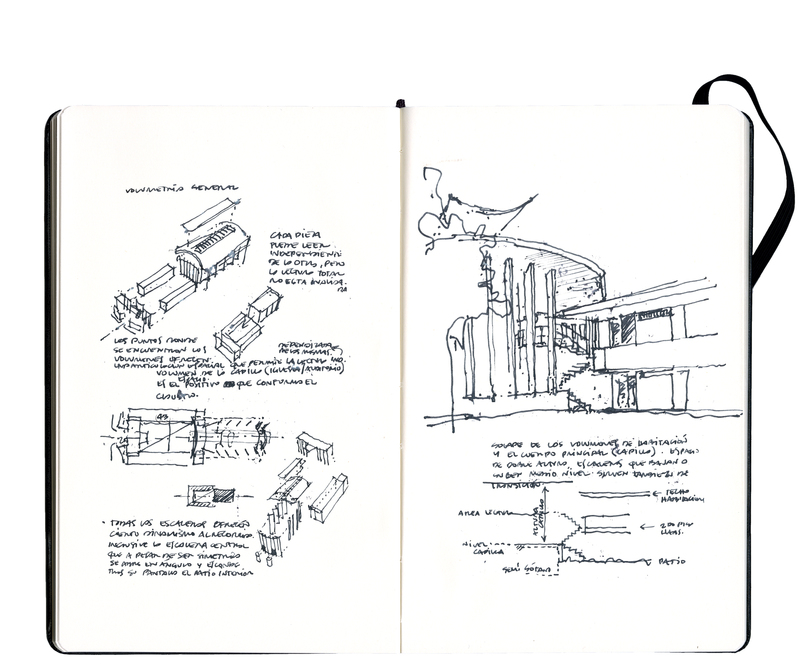 Here are some sketches I did last Saturday on a trip with Jorge Rigau’s course on History of Caribbean Architecture. Condición urbana (parque/plaza) en Yauco; diagrama espacial de la residencia Franceschi (tipo sala-pasillo-comedor) y alzado parcial de la Villa Ange del arquitecto Pedro Méndez. Fachada frontal de la Ermita de Porta Coeli y un diagrama de la condición urbana (parque/plaza) en San Germán. Diagrama espacial de la Residencia Acosta y Forés (tipo A-B-A), perspectiva del mediopunto en la sala y un detalle de los estarcidos del área del comedor. Diagrama espacial de la Residencia Ortíz Perichi y una perspectiva de la Residencia Vélez del arquitecto Henry Klumb. Follow up on a previous post from October 9, 2011.